August 01, 2017 / Matt Smith! This week's comic is a sequel to last week's Small Time Con 1. I previously made comics about my convention experiences back in Victoria Comic Book Expo 1 and 2. Emma and I had a great time at the Vancouver Comics Art Festival, the Curious Comicon in Nanaimo, the Camosun Comic Arts Festival, Cherry Bomb Toys' Ultimate Hobby & Toy Fair, Courtenay's In-Con and the previously mentioned Victoria Comic Book Expo. 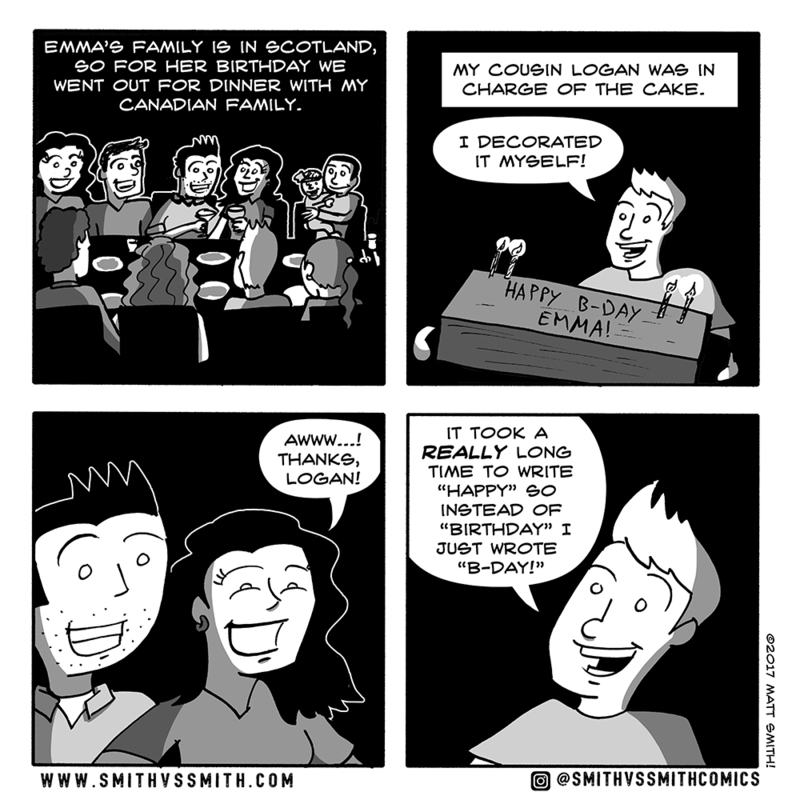 As you can see in panel 2, I do have loads of Smith vs Smith social network profiles! Be sure to follow me on your favorite social network, whether it's Instagram, Facebook, Twitter or Tumblr. We are in the process of moving back to the Middle East, but I am determined to keep Smith vs Smith going. Come back next Thursday for a sequel to this comic! April 20, 2017 / Matt Smith! This comic originally appeared in the Camosun College Nexus student paper. If you're in the Comox Valley, be sure to come say hi at the Courtenay In-CON. I'll be selling comics and leading an interactive panel on Being a Smarter Comics Reader and Creator. April 07, 2017 / Matt Smith! Emma makes her Canadian stage debut April 20th with Reefer Madness. Get your tickets now! Emma and I actually met through community theatre (she was the choreographer and I played "Sonny" in Grease in Kuwait). I'm very excited to see her perform for the first time over a year! This comic originally appeared in the University of Victoria's Martlet. April 04, 2017 / Matt Smith! More exploits from my first comic convention, the Victoria Comic Book Expo. I've got a few more convention appearances booked this summer. Come and say hi! It was really great meeting fellow Fernwood cartoonist Axel (creator of Roach Town) and colouring book creator Shea Proulx. It was so awesome talking about making comics and the life of a freelance artist. Check out their stuff! If you're interested in my comics with light swearing, wife-swapping jokes and cats licking themselves, check out my brand new online store! Or if you live in Victoria, head over to Legends Comics! March 28, 2017 / Matt Smith!